"He changed china, albeit in his own way…"
At first glance Canadian vagabond Rudy Kong's discovery of life in China would not be high on the reading list of most hockey book enthusiasts. But I am here to tell you that you would be wrong, and that there is one at least one chapter in Kong's book Dragons, Donkeys and Dust that you simply must read. Kong is a Canadian physical education teacher living in and raising a family in China. I'm still living in the town I grew up in. This guy moved half way around the world! Fortunately I can live vicariously through him in this highly acclaimed book. How acclaimed? 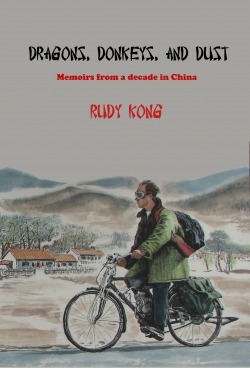 None other than CBC's China correspondent Anthony Germain (there's someone who would understand Kong's journey if there ever was one) says the "book is filled with fantastic anecdotes . . . . some marvelously critical, others just very charming." I haven't had a chance to read the whole book. Unless you live in Vancouver (where it is for sale at The Travel Bug on W. Broadway), you can only order this book online (author's website, Amazon.ca or Amazon.com) or pick it up in China. But he does have one chapter available for free on his website - and fortunately for hockey fans, it is the chapter we should all be reading. "Buddha Loves Hockey" is all about the authors' discovery of the few locals who love hockey (and that unfailingly means they love Igor Larionov) and his introduction of the sport to his students and his community. It is great writing where shares not only what he learns about China and it's people but about himself and the great Canadian game. Give the free chapter a read and then consider buying the whole book. See if you laugh as heartily at David The Aussie's introduction to hockey as I did. You also will find yourself so very impressed with the author's writing and storytelling that you will want to read all of his non-hockey chapters, as well.